AMD's new Radeon R300s will show up in stores today, but without a few things we'd like to see. After being announced mere days ago, AMD’s new Radeon R7 and R9 300 series graphics cards are scheduled to hit the streets today, but you probably want to hold off on buying one. Why? There are a few different reasons. First of all, know that the Radeon R7 and R9 300 series cards don’t feature the cutting-edge high-bandwidth memory or new, transistor-packed “Fiji” graphics processor found in AMD’s new flagship Radeon R9 Fury X. Instead, AMD representatives confirmed that the R7 and R9 cards indeed pack graphics processors from the older R200 series lineup, which debuted in 2013. The representatives were quick to say this was no mere rebranding effort, however, using the R9 390 and R9 390X as examples. 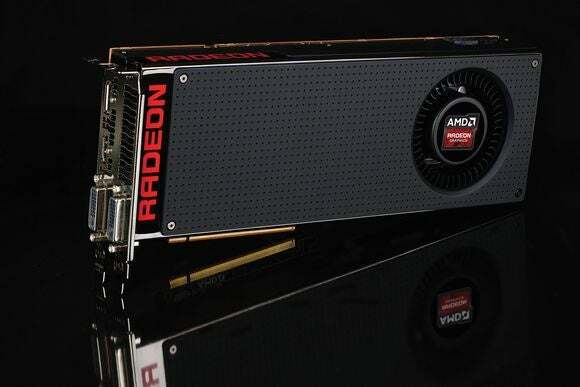 AMD says the GPUs were retooled for enhanced power management and efficiency. The memory subsystem was tweaked as well, both to support the 8GB of RAM that now comes standard with each card as well as to increase the memory clock speed to 6Gbps, from the older R9 290X’s 5Gbps. The GPU clock speed on each has also been bumped up by 50MHz. 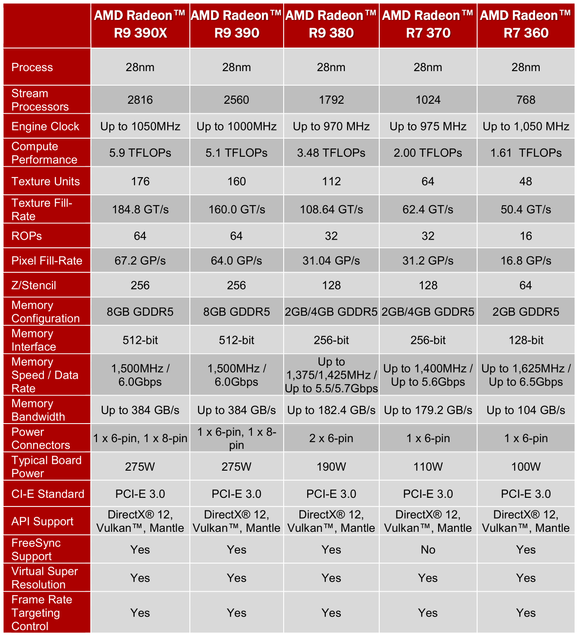 Tech specs for all the new Radeon R7 and R9 300 series graphics cards. AMD sent out a reviewer’s guide comparing the various R300 series cards’ performance against their Nvidia counterparts, but crucially, not the older Radeon R200 series. For folks solidly in the Team Red camp with no plans to buy anything GeForce, that’s obviously the key comparison—but one we can’t comment on, because AMD didn’t send us units for review ahead of the R7 and R9 300 series launch. AMD-supplied benchmarks comparing the new Radeon R9 390 and 390X against Nvidia’s GeForce GTX 970 and 980 at 4K resolution. To be honest, none of these cards are likely to provide a satisfactory 4K gaming experience. When queried on Monday, the day before the cards were announced during an E3 livestream, representatives told us to ask board partners (Asus, Sapphire, MSI, etc) for review units. No company I’ve contacted has review units available yet. Does spending $429 on a Radeon R9 390X with 8GB of memory over a $300 R9 290X with 4GB of memory really make sense? Does the newer card offer enough of a performance boost over its predecessor to justify an upgrade? We simply can’t answer those questions yet, and that’s doubly worrisome with the rebranding concerns and unusual lack of early review units—though AMD representative say the new R9 390 and R9 390X both outpunch the older R9 290X flagship. Bottom line: We recommend waiting to pull the purchasing trigger until reviews of the new R7 and R9 300 series cards start to dribble out. You want to make sure you’re fully informed before spending hundreds on new hardware. Either way, it’s disappointing to see the bulk of AMD’s “new” graphics card lineup consisting of old GPUs, no matter how amazing the Fury X looks. For more detailed information on the Radeon R300 series graphics cards, their price points, and supported features, check out our original coverage of AMD’s new hardware.